Extreme kitchens are interiors that make your jaw drop. They’re like nothing anyone has ever seen anywhere else. Why not take your kitchen to the extreme with these inspirational ideas and design choices? In Top 5 Crazy Looking Range Hoods and Top 5 Crazy Looking Range Hoods Part 2, you’ll see range hoods that look like sculptures or lighting fixtures. These designs give a new meaning to the word “hood.” Bring creativity and elegance to the kitchen with designer range hoods like these that will make your kitchen design pop. For example, in the photo below, you can see how the Sopresa Vertigo Double from Best Range Hoods looks like metal artwork, but it is in fact a working kitchen range hood. It looks like someone built this kitchen around an existing tree. It would be relaxing to be so close to nature while cooking family meals and creating memories in the kitchen. 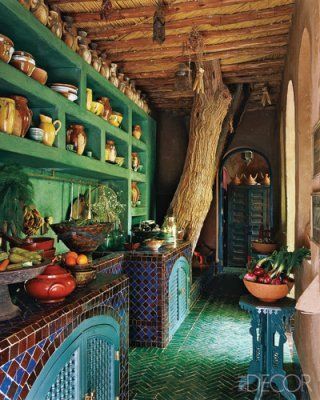 Add some potted plants and this will feel like an outdoor kitchen. 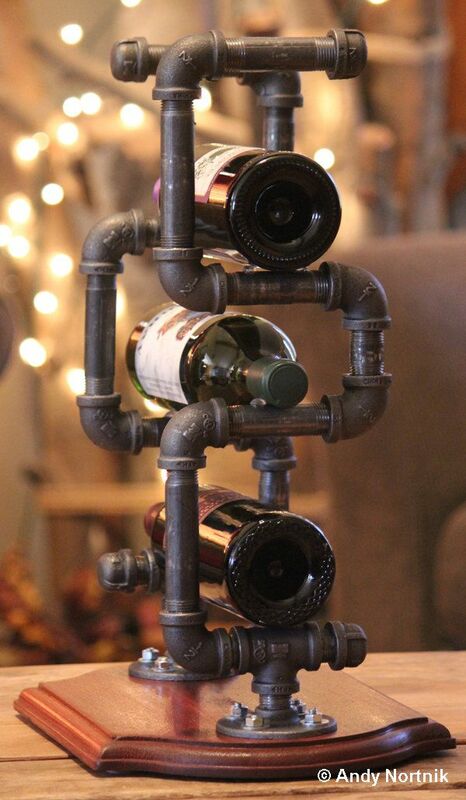 This unique wine rack brings an industrial and “steam punk” look to the kitchen. This piece would look great in a bachelor pad. The style adds a custom look to the kitchen. SkidawayPipeWorks on Etsy offers a similar feel with its one-of-a-kind kitchen pot and pan holder design. This “industrial modern décor” is outside of the box and handmade. The photo below is another example of an industrial, modern kitchen with one-of-a-kind pieces. 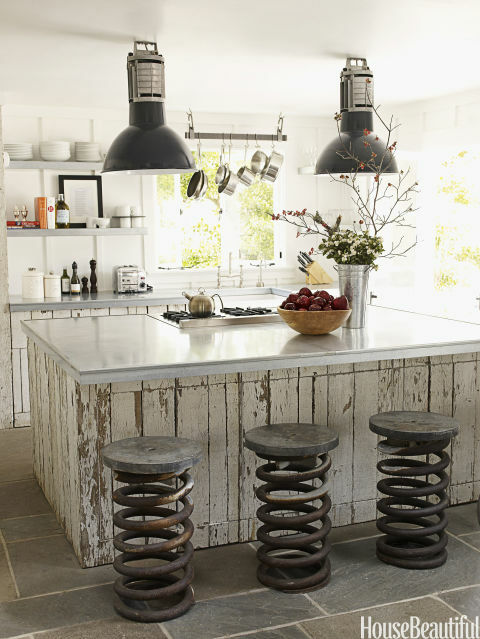 It looks like the bar stools may have been created with reclaimed materials. The oversized lights fit well into the design and frame the kitchen island. Lighting can create a “wow factor” in the space. Choose lighting with flair and style that complements your kitchen décor. Lighting designs share the impressive visuals of artwork and sculptures; these are visuals that will distinguish your kitchen from others like it. This designer made a daring move with a bright blue color for all of the cabinets but it pays off. The cabinet color matches well with the flooring. Meanwhile, the large range hood exterior makes a big, fabulous statement. 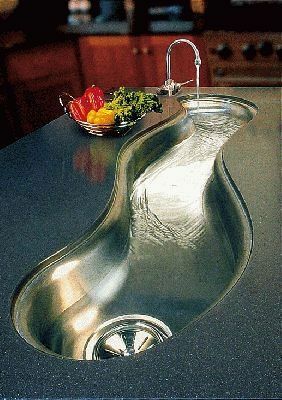 A river sink takes kitchen sinks to a whole new level. One way to make use of a river sink is to fill it with ice to keep drinks and/or food items cold while entertaining. The look will also create a beautiful and impressive presentation. Perhaps a river sink can also be used to wash a lot of produce at once. The river sink design creates a curve that the eye wants to follow along the counter. Make your kitchen your own and write on the walls. Create a chalkboard wall using chalk paint. You can create shopping lists and notes. Let out your inner child! 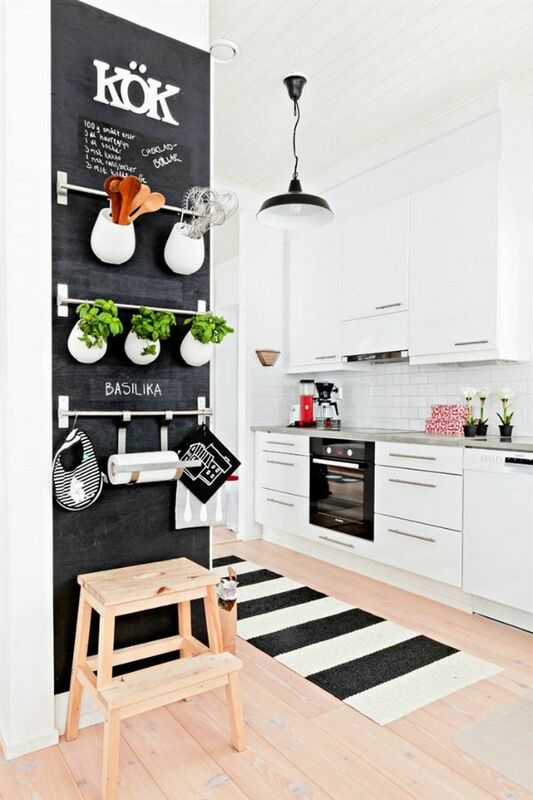 The kitchen below also has a chic black and white color scheme that allows the chalkboard wall to fit in subtly. We hope these ideas have inspired you to create fearless and extreme kitchen designs! This entry was posted in Home Improvement, Kitchen Design, Kitchen Tips, Range Hoods and tagged art, cabinetry, design, interior design, kitchen, range hood, range hoods inc on May 18, 2015 by editor. Under cabinet range hoods are perfect for small kitchens, in which a wall mount range hood will not fit because of the cabinet design or because of space limitations. Under cabinet range hood models allow you to avoid removing an existing cabinet. You may also consider hiding the range hood within the cabinet above the stove. If you are in the market for an under cabinet range hood, look through these bestselling models from Range Hoods Inc. Exploring under cabinet range hoods may give you the inspiration you need to make decisions for your kitchen remodeling project. This stylish model from the Cavaliere-Euro series features a sleek design with a low profile that will not overwhelm the viewer. The soft push button control panel is subtle and the quiet system allows use that is not disruptive. This second unit is also from Cavaliere range hoods. This model is larger and features elegant curves in the front. The touch sensitive electronic LCD control panel and brushed finish stainless steel make this powerful under cabinet range hood a modern choice for kitchen design. The top curves down in this innovative model from Cavaliere for a futuristic look that will feel right at home in your kitchen remodel. This range hood delivers the right amount of power for kitchen ventilation as well with 350 CFM at three different speed levels to choose from. Beautiful curves frame the range hood on each side in the front. The two LED lights make it easy to read and adjust the settings on the touch sensitive keypad. Also, the 30 hours cleaning reminder helps with remembering to clean the baffle filters, which are dish-washer friendly. The baffle filters in this under cabinet range hood give it a professional look and they are dishwasher-friendly. This hood delivers a lot of power for an experienced home chef. The touch sensitive keypad with blue LED lights gives the user complete control over the settings. Note, these models can function as ducted or ductless range hoods. They can be converted to ductless with a re-circulating kit that is oftentimes used in apartment homes in which ductwork cannot be installed. If you have questions about these under cabinet range hoods model, call us at 1-800-914-9775. Our team is available seven days a week to assist you in choosing the range hood model for your kitchen design. This entry was posted in Home Improvement, Kitchen Design, Kitchen Tech, Professional Range Hoods, Range Hoods, Under Cabinet Range Hoods and tagged home improvement, kitchen, kitchen design, kitchen remodel, LED lamp, range hood, range hoods inc, under cabinet range hood on May 13, 2015 by editor. Are you planning a kitchen remodel? Don’t forget to choose the right kitchen sink for you. Kitchen sinks are extremely important because they’re used practically every single day. The kitchen sink comes into play when you’re doing dishes, washing produce, prepping food, etc. When it comes to sinks for the kitchen, the possibilities are endless. The following article will help you make sense of kitchen sink materials, bowls, size, shape, mounting and more. First, decide which sink material you would like to have in your kitchen. This comes down to personal preference, depending upon which traits are most important to you. For example, which is more important to you: the durability of the material or the color? Read on to learn more about different common materials used in the construction of kitchen sinks. Stainless Steel – Stainless steel kitchen sinks are very durable and simple to clean. However, they can produce a lot of noise while you’re washing your dishes. Be sure to put pads on the sink that will lessen the noise if you go with a stainless steel sink, or purchase a stainless steel sink that comes with the noise-reducing pads. Porcelain – Porcelain sinks are available in more colors than some other materials. However, porcelain is also prone to chips and stains. If durability isn’t a major concern for you, then porcelain is a good option. However, if you are hard on your sink, then you may want to consider a more durable option. Cast Iron – Cast iron sinks come in many colors, and they are easily cleaned. This durable material is covered in a layer of enamel. 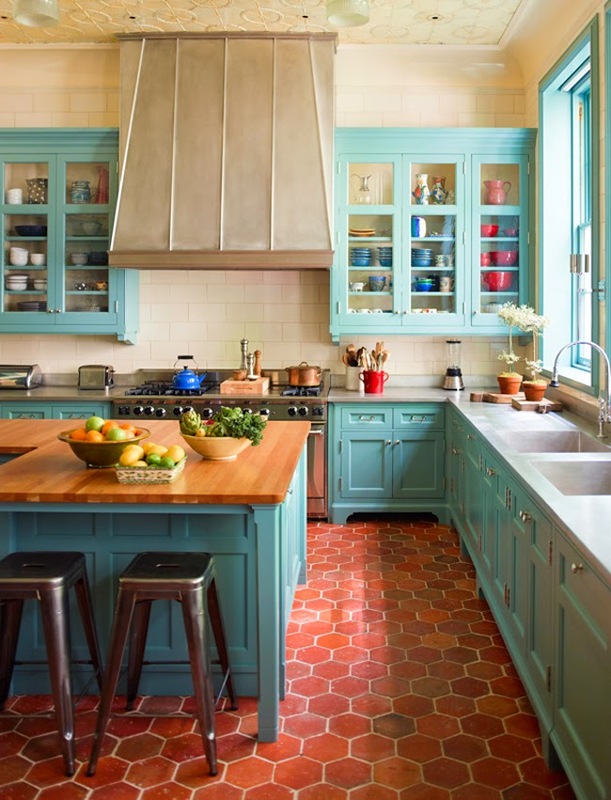 A cast iron sink in a beautiful color is a good choice for a kitchen design. Composite Granite – Composite sink materials are made out of a mixture of different materials. Composite granite sinks come in different colors as well. Additionally, composite granite is a durable material. If the composite contains more granite, then it’s even more durable. 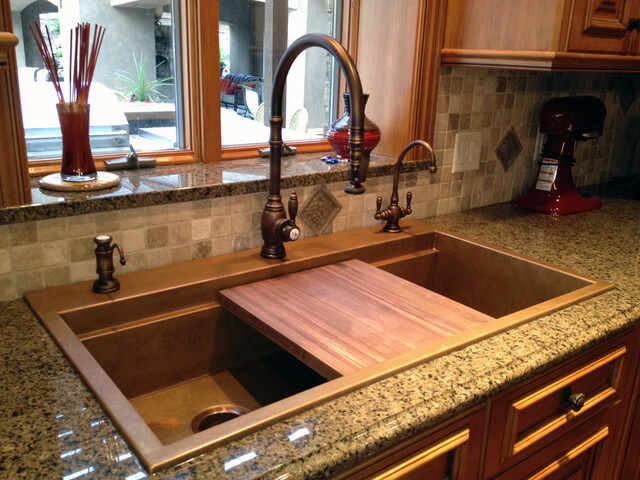 Copper – Handmade copper sinks have a beautiful natural color that will create a focal point in your kitchen design. As well as being made out of a durable material, copper sinks do not rust and they are resistant to bacteria. Solid Surface – Solid surface sinks come in many beautiful colors; however, these sinks are not as durable as other options. Also, note that installation is more complicated and may be more costly. Beware of scratches, chips and damage from hot pots and pans. Some scratches can be buffed out of the surface. Fireclay – Like some of the sink materials above, fireclay sinks are durable and come in many colors. Note that fireclay sinks are also non-porous, resistant to rusting and resistant to bacteria. We’ve just touched the surface in this blog. Search around to learn more about other sink materials that are available in the market and choose the best one for you and your kitchen. The height at which the kitchen sink is installed will depend upon the height of the people using it the most. For example, if the homeowner is very tall, then that person would have to bend over to reach the bottom of the sink. Adjust the sink height accordingly to make using the sink more convenient for those living in the home. The number of bowls in the sink that are needed generally depends on the person’s preference. Multiple bowls are great for homeowners that do a lot of cooking and need more bowls for multi-tasking during cooking prep and while washing pots and pans. The arrangement of the bowls is also up to the user. However, generally, it is better to place the garbage disposal near the dishwasher. Also, right-handed and left-handed users may also want the bowls on different sides for ease of use. A good rule of thumb for deciding on the size of the kitchen sink is to compare it to the size of the overall kitchen. It makes more sense to install a large sink in a large kitchen. Otherwise, a large sink in a small kitchen will take up precious counter space. Therefore, consider how much counter space you are willing to live without. Perhaps sacrificing counter space for a larger sink would be perfect for you; others may prefer to reserve counter space for food prep and storage. In general, kitchen sinks are 36 inches to 42 inches tall and 25.25 inches to 26 inches wide. Sink size may also be influenced by how much cooking you do throughout the week and the type of food prep you do. Some homeowners will need a bigger sink to accommodate their needs. -Farmhouse sinks have an apron front that becomes a focal point in the kitchen design. -A double farmhouse sink is similar to the farmhouse shape but includes two sides. -A kitchen sink with rounded-sides is easier to clean than one with angles in the corners. -The bowls in D-bowl sinks are shaped like a “D” with the straight edge closest to the user. Mounting your kitchen sink may be a no-brainer because mounting style is often determined by sink material. Certain sinks are mounted in different ways depending on what materials they are made out of. Undermount sinks: This mounting style puts the sink under the counter. Undermount sinks are situated 1 to 1.5 inches lower than drop-in sinks. Undermount sinks are easy to clean; this mounting style works well with granite sinks. Drop-in sinks: You may also hear these sinks referred to as top-mount sinks. With this mounting style, the sink is lowered onto a cutout in the kitchen counter. The sink rests on top of the counter. Drop-in mounting is used while installing stainless steel kitchen sinks. In larger, luxury kitchens, multiple sinks are sometimes installed. You may want a second sink on your kitchen island to allow more food prep and to fill different pots with water at the same time. However, remember that installing the plumbing for a second sink (if it does not already exist) can be costly. Kitchen sinks are generally 6 to 12 inches deep. You may want to install a kitchen sink on the deeper side if you wash a lot of large pots after you cook. The tappings are the number of holes in the sink deck. Be sure to check the number of holes in the sink deck before purchasing a faucet for your kitchen sink. You want to be sure that the sink holes match up with the faucet you are installing. 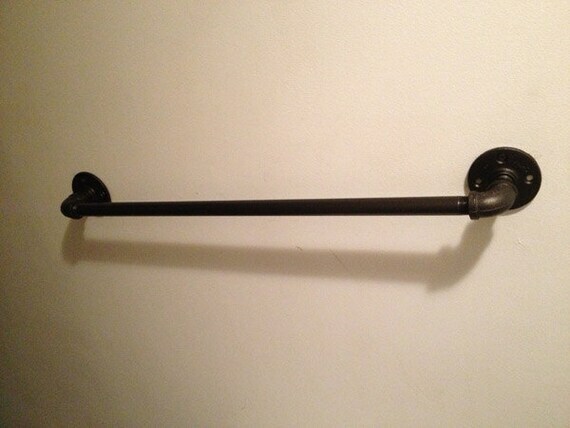 If there are too many tappings, you can purchase covers to hide them. You will also need tappings for sink accessories, including soap dispensers, filtered water faucets and spray hoses for washing dishes. While you’re choosing your kitchen sink, you might as well start thinking about whether or not you want to purchase sink accessories. Sink accessories are designed to fit on top of your sink. Examples include cutting boards, food prep bowels and colanders. These accessories allow you to do food prep on top of the sink, which frees up counter space for other tasks and storage. Use this article as a guide to help you choose and design the kitchen sink that’s right for you. Remember, you can adhere to trends and style in interior design; however, be sure that at the same time, you are picking out a kitchen sink that meets your particular needs and desires. We wish you the best of luck in creating your dream kitchen. This entry was posted in Home Improvement, Kitchen Design, Kitchen Sinks, Kitchen Tips and tagged copper sink, drop-in sink, interior design, kitchen, kitchen design, kitchen sink, range hoods inc, sink, stainless steel, undermount sink on May 4, 2015 by editor. Ever wonder how to get those range hood filters clean? Check out this infographic from Range Hoods Inc for some tips and tricks. This entry was posted in Cleaning the Kitchen, Filters for Range Hoods, Kitchen Tips, Range Hoods and tagged cleaning, cleaning range hood filters, how to clean, kitchen, kitchen range hood, range hood, range hood filter, range hoods, range hoods inc on May 4, 2015 by editor.